When his Aunt Winnie sends 13-year-old, Jem, away from Charles Town into care of former slave named Phaedra, Jem struggles with resentment and anger. Though lucky to escape his cruel master, Phaedra's demands make Jem feel like he has never found freedom. Instead of doing what he wants, Jem spends his time running errands for Phaedra at Fort Mose, a fort in Florida occupied by runaway slaves who have pledged their allegiance to the Spanish against the British in exchange for freedom. Jem really wants to join the militia, but Phaedra insists he is too young. Instead, he runs errands for her and explores the forest where he finds a baby owlet he calls Omen. His adventures in the forest also lead him to the discovery of a slave rebellion. The English blame the Spanish for the uprising and declare war. Jem must overcome a series of missteps to help the people at Fort Mose, or face certain death. After living in harsh slave conditions, Jem's resentment toward Phaedra seems out of place. However, solid writing in handling a mature subject matter easily outweigh any character flaws. 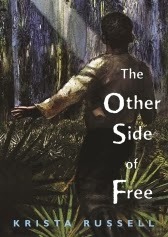 Though the younger middle grade reader may find The Other Side of Free challenging, the older reader may find the little known events in 1700's slave history fascinating. A solid piece of historical fiction by author Krista Russell. I would love to win this book for my son. Jem is close to the same age as him so I think he'd like to read about his adventure. I loved the Red Badge of Courage when I was growing up. I do not think that my nephew has a favorite historical fiction book. All I ever see him reading is Harry Potter books. I would like to see him read something else.